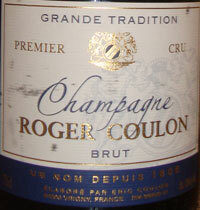 Champagne Roger Coulon is a small Grower Producer in Vrigny, in Montagne de Reims, 20 km south of Reims, with 9 Hectares of Grapes producing about 95,000 bottles of wine each year. The family had been growing grapes and making wine for 8 generations, since 1806, with Eric and Isabelle Coulon now in charge, and has 70 plots of vines in 5 villages mostly with prime southeast facing slopes. Vines are 40% Pinot Meunier, 30% Pinot Noir, and 30% Chardonnay, average 38 years old, and no cloned vines are planted. Yields are limited through a number of techniques including pruning, debudding, and strict selection at time of harvest (not harvesting any grapes that do not look "good to eat"). 40% Pinot Meunier is a very high percentage, especially for a grape considered by most to be vastly inferior to Chardonnay and Pinot Noir, but Eric Coulon insists that Pinot Meunier, especially with old vines, is capable of producing extremely high quality. It certainly adds to the fruitiness and openness of his wines, and quite nicely too. Many producers, both big houses for their best wines and Grower Producers, skip Pinot Meunier altogether. I am not sure I agree with Coulon, although I have only tried one of his wines as of this writing. I very much enjoyed the Brut Grande Tradition Premier Cru (tasting note below), but by the end of the bottle was somewhat boring with the high levels of forward and friendly fruits, a hallmark of Pinot Meunier. This would be a great bottle to share with a cute babysitter or Fairy God Daughter, or perhaps with a fruit cup or similar as a palate cleanser during a multi course meal. This would be an ideal wine for a Champagne brunch as well. Minimal herbicides and pesticides are used, so called "Lutte Raisonée" (reasoned agriculture), only naturally occurring yeasts are used, and some reserve wines and all Chardonnay are aged in small oak casks. Other wines mature in temperature controlled stainless steel vats. Malolactic fermentation is only done when needed. Brut Grande Tradition Premier Cru which is 50% Pinot Meunier, 25% Pinot Noir, and 25% Pinot Meunier, with 7 grams of dosage per liter and aged 3 years before being released. Brut Réserve de L'Hommée 1er Cru which is equally one third Pinot Noir, Pinot Meunier, and Chardonnay, with 6 grams of dosage per liter and aged 5 years before being released. Brut Rose which is 80% Pinot Meunier and 20% Pinot Noir with 6 grams of dosage per liter and aged 3 years prior to release. Brut Millesime Vintage Champagne which can very depending on the year dramatically, for example from 80% Chardonnay to 50% Pinot Noir and 50% Pinot Meunier as in 2004. It has minimum dosage and long aging, for example the 2004 has 5 grams of dosage and is aged 6 years prior to release. A medium yellow color with plenty of mid sized bubbles. On the nose, sea foam, wet stones, chalk and plenty of ripe fruits in the distant background like apples, pears, citrus. The palate is more about fruits than the nose with juicy crisp apple, some orange citrus and lime. The 50% Pinot Menuier is clear in the forward and open nature of this wine. Quite pleasant although not very complex. It's just fun and well put together, but I'll admit after a few glasses I was somewhat bored with it. Grape harvesting (by hand) and pressing at Champagne Roger Coulon.